SRE has long been identified as the SRE eagles. There were only a few long-term employees and staff who knew that however! As far as we could find, with some digging, there were never any school colors associated with SRE. 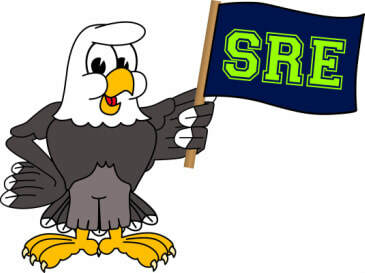 ​So...in the spring of 2012, the PTO initiated a committee to establish the mascot and colors for SRE. All staff, families, and students were given the opportunity to submit suggestions for color choices and combinations as well as mascot possibilities. All were allowed to make suggestions in Part One of this process, but only teachers, staff and students were permitted to vote. Voting was done during school hours and the results brought us to the Eagle (although he may look a little different than he did many years ago), and navy/lime green winning by a landslide!